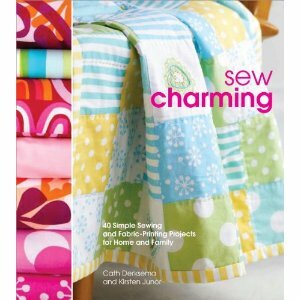 Once again it's time for us to talk about another great book - Sew Charming by Cath Derksema & Kirsten Junor! Cath & Kirsten own an Australian fabric design studio aptly named "Prints Charming". Their fabric is distributed by Marcus Fabrics, and they also hand print fabric for customers, make soft furnishings, gifts and clothing, and teach classes. Their designs are so colorful and vibrant! Now, this is not your ordinary sewing book. It's going to take you in a direction you may not have gone before - designing and screen printing your own fabric! As any good how-to book should, it starts off with the basics - the equipment you'll need, sewing basics, quilting basics, and an embroidery stitch guide. After that, the next two chapters focus on screen printing. Then it's time for the projects! There are 40 in all, and they range from an embroidered heart pillow to brooches to a headboard - quite a variety! They include three pattern sheets, and there are screen printing patterns in the book as well. It's not spiral bound, but it does have a handy flap on the cover that you can use to hold your place. Even though we may not get adventurous enough to try screen printing, there are still some fun projects in the book that we're going to try out. We'd like to give you a chance to try this book out, so we're excited that Potter Craft is generously donating a copy for us to give away! Leave a comment here telling us why you'd like to win it. Make sure the comment also includes your first name, last name, city and state so we can find you. Be sure to like us on Facebook as well, and fill out our contest registration form - the link is located on our Facebook page. Deadline for comments is Tuesday, Sept 4th, 2012 at 5 pm Eastern time. Last but not least, we'd like to announce the winner for our previous Book Nook. It's Marilyn Snow from Orem, UT! Congratulations Marilyn! Nice giveaway because this book looks very interesting. that is awesome. I love how to books, lol. One reason I'd like to win is that I can't afford to buy it! LOL! Thanks for hosting this! Looks like a "charming" book that would make a great addition to my sewing library. I would love to learn to design and screenprint!! Like a book that starts with basics and goes into something new. I love to try new things. Educational books are my thing!!! Would live to learn all about screen printing my own fabric! What a fantastic book. I can't wait to pick one up! Thanks for sharing! I've been wanting to try this! What an opportunity! Thanks. That would definitely give me a "how to" since I've been wanting to try and design my own. Thanks for allowing us the opportunity to enter!! Wow, sounds like it covers a little bit of everything. All things I want to try. I would love to win this so I can stretch my creative wings, and maybe make the headboard. Been needing a headboard for years! The brightness is attractive. Hope for joy inside. Looks like an awesome book! I still consider myself a beginner and this looks like it would be a great book for me. Looks like a great book with fun projects. I love the looks of this book! Inspirational! I'm intrigued by the screen printing section of this book. Sounds fun. What a wonderful book. Thanks for the opportunity. Thanks for the giveaway! I have been towing with this and this book would be a big help. Designing fabrics would help get the colors I want. It would give me inspiration for new items to sew. Screen printing sounds like something new to try. Maybe even try it with the RV'ers this winter.